For centuries, sailors have suffered and died of this disease. For many centuries after, doctors used lemons, limes and oranges to cure that ailment. But it wasn’t until as late as 1930s that Vitamin C was finally discovered to be the compound present in lemons that provided the cure. With all the necessary micronutrients discovered, people are armed with the knowledge to fight these deficiencies. Enter Multivitamins. These supplements are packed with common types of micronutrients that people are suffering from. The best part is, they come in different sets of vitamins and minerals to suit different purposes. And we’re here to tell you which one to go for under which circumstance. Whenever browsing through the internet for something specific, you’re always to guaranteed to come across a sketchy looking article or two claiming things that seem to be borderline improbable. Among all of them, it’s difficult to keep track of which sites to trust and which sites not to. Then, there’s always the chance that your trusted site slips up and brings you a complete garbage of an information that might get you into trouble (I know of such an experience where a person trusted the wrong site about surviving in the wilderness). Experience: We’ve been doing this for a while now here at Supplemania. For the past five years to be exact. Our founders have worked in different fields of research, medicine and nutrition in their career, and know the exact methods of testing these kinds of products and reviewing them. “You” Oriented: We’re focused on “you”. Our sole purpose is to aid you in deciding which product to buy for your health’s well-being. We are not affiliated with any of these product brands and so, we have no reason to promote or bash on any of these products except if they are good for YOU or bad. Objective: We’ve had different people involved in the whole research and review process, thus, eliminating any subjective views that any single person might have on a specific product or a brand. Expertise: Our team is comprised of a Physician, a Biochemist, a Nutritionist and a Beautician. With such a team, we complement each others’ skills and knowledge, creating the perfect team to deal with product research and review of supplements. With our expertise, we can analyze the supplements on the basis of their Health Benefits, Chemical Composition, Nutritional Values and Their Impact on your Skin, Hair and Appearance. Customized: This review will be dealing with the issues of how multivitamins can affect you and aid you with different specific problems. This review is customized for different groups of users (such as determining the best multivitamin for women and the best for seniors) and deals with how the Multivitamins can help with your full-body wellness considering your age, gender or profession. Vitamin A: This Vitamin is essential for the health of your eyes and helps in preventing diseases such as Night Blindness, hyperkeratosis, keratomalacia. Usually, natural food sources, like Carrots and Livers are great sources of this nutrient. However, the recommended daily dosage of this vitamin is 900µg for adult males and 700µg for adult females. An overdose of this vitamin can lead to a condition known as Hypervitaminosis A.
Vitamin B Complex: Vitamin B Complex is actually a combination of different types of vitamins known as Thiamine (B1), Riboflavin (B2), Niacin (B3 contains other compounds along with Niacin), Pantothenic Acid (B5), Pyridoxine (B6, contains other compounds too), Biotin (B7), Folic Acid (B9) and different forms of Cobalamine (B12). 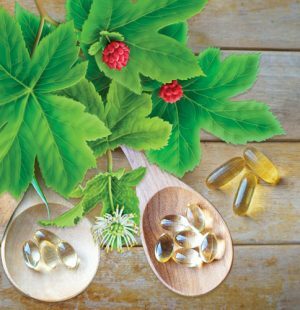 These vitamins carry out different functions in the human body, such as Cellular Metabolism, Skin Health, Brain Cell Development, Hormone and Cholesterol Production and much more. Deficiency in any one of these vitamins can lead to diseases like Beri Beri, Paresthesia, Dermatitis. Vegetables, Leafy Products, Dairy Products, Rice and Eggs are the best sources of getting all these different Vitamin B types. Vitamin C: Also known as Ascorbic Acid, is responsible for tissue repair and reinforce the collagen to a stable form. A deficiency of Vitamin C can lead to a severe health condition known as scurvy, where blood leaks out of the body through the skin, teeth falling out due to weak gums. Vitamin C is primarily found in tangy fruits and sour fruits, liver, and other vegetables. The minimum required intake of 90 mg is required for adult males and 75 mg for adult females. No side-effects for a Vitamin C overdose has been observed (except maybe for some problems with tooth abrasion caused by the acids during intake on a regular basis). Vitamin D: Vitamin D are derivatives of Cholesterol that is synthesized in the body. However, the body requires a form of chemical reaction to be able to synthesize Vitamin D. Such reaction occurs from the UVB radiation from sunlight touching the skin. Vitamin D is necessary for the proper absorption of calcium in the body. A lack of Vitamin D can lead to the bone diseases: Rickets and Osteomalacia. However, synthesized Vitamin D can be readily found in food such as eggs, liver, fish, and mushroom and mushroom supplements. The daily intake requirements for both males and females are 15 µg however, for people over 70, the upper limit can be around 20 µg. Exceeding this daily intake value on a regular basis can lead to a case of Hypervitaminosis D, leading to problems like hypertension and an over-calcification of bones. Vitamin E: Comprised of compounds known and tocopherols and tocotrienols, Vitamin E is responsible for balancing out free radicals in the body and act as antioxidants, reducing cholesterol levels. A deficiency can lead to sterility in men, miscarriage in women and hemolytic anemia in infants. In order to avoid such problems, an intake amount of 15 mg per day is recommended. Vitamin E can be commonly found in fruits, nuts, and seeds. Vitamin K: Vitamin K is required for the body to regulate blood clotting functions. Consisting of Phylloquinone and Menaquinones, this Vitamin deficiency can lead to bleeding Diathesis, which means, an injury would not heal and keep on bleeding. In order to stay on the safe site, 110 µg of Vitamin K should be taken per day. It can be found in foods like Liver, Egg Yolk and Leafy Green Vegetables. Calcium: Calcium is an element that is necessary for maintaining bone density and repairing damaged bones. With Vitamin D regulating the calcium levels, these minerals help the bones remain strong and stable. However, they are also important for muscle, heart and digestive system, and synthesis of red blood cells. Calcium ions, in the body are required for neurons to fire the electrical impulses required for motor and memory functions. A deficiency in calcium can lead to hypocalcemia, leading to issues like kidney problems, pancreatitis. The recommended daily intake is around 1.2 g – 2.5 g. Crossing that intake level could lead to hypercalcemia, which can lead to muscle pains or kidney stones. It is commonly found from foods like animal bones, dairy products, and nuts. Chlorine: This element is necessary for the production of Hydrochloric acid in the stomach for digestive functions as well as in cellular pumping function. The body usually gets its recommended dosage from table salt. The recommended dosage for this mineral is 2.3g to 3.6g a day. A shortage of this mineral can cause problems like hypoventilation (slower heart and breathing rate). Chromium: Scientists are still struggling to confirm the benefits or the importance of this mineral for a healthy life, however, it’s generally supported that Chromium is essential for glucose and lipid metabolisms. The body requires a trace amount of this nutrient (only 0.035 mg) and can be obtained from Broccoli, Red meat, grains, etc. It’s important to keep a lookout for overdosing on Chromium (Chromium Toxicity). However, the effects of a Chromium Deficiency is still under investigation. Copper: A trace amount of this element, namely 0.9 mg, is required for the body to redox different enzymes such as Cytochrome C Oxidase. Copper can be obtained from food sources such as Nuts, Seeds, Legumes and some seafood. Iodine: Iodine is required for synthesizing thyroxin and other thyroidal hormones. A deficiency can cause hormone imbalance and an enlarged thyroid – a condition known as goiter. Usually, different manufacturers add iodine in the table salts to help people overcome this deficiency. However, iodine can also be obtained from natural sources such as eggs, grains, and seaweed. A daily intake of 0.15 mg is required for healthy thyroid functions. Iron: Iron, being the main element of Haemoglobin (what makes up red blood cells), is important for blood cell production and preventing anemia, as well as processing proteins and enzymes. It is found in meat, seafood, hyacinth plants, beans, and different animal organs. Due to iron being recycled by the body, despite all the blood cells requiring iron, you only need 18mg of iron a day. Magnesium: Magnesium is a mineral that’s responsible for processing and manufacturing ATP for maintaining the bone structure. An average person requires about 420 mg of magnesium a day for a healthy body. A mineral deficiency can cause a lot of problems like muscle aches, fatigue, abnormal palpitations and much more. It can be found from vegetarian food sources, mainly from spinach, nuts, legumes, avocados, etc. Manganese: Manganese is usually required as a cofactor for different enzyme functions in the body. Recommended daily intake of Manganese should be around 2.3 mg per day. This mineral is usually found in food products such as grains, legumes, tea, coffee, nuts, and other green vegetables. Molybdenum: Molybdenum works as a cofactor for different oxidase enzymes in the body. Nutritionists suggest an adult person to take around 0.045 mg of Molybdenum per day. Without the daily recommended dosage, the enzymes such as Xanthine Oxidase, Aldehyde Oxidase and Sulfite Oxidase will not be produced in the body. One can avoid such problems by having Molybdenum-rich foods, such as Legumes, Whole Grains, and Nuts. Phosphorus: Phosphorus is one of the components that build up our bones and cells and is the main component required for the production of ATP (Adenosine Triphosphate) – the compound broken up to produce energy for the body. A deficiency of Phosphorus can lead to hypophosphatemia, which can result in swollen gums, weakness, and several other health problems. According to the FDA, a daily intake of 700 mg of Phosphorus is required to avoid such problems. This amount of Phosphorus can naturally be obtained from meat and dairy sources as well as from bread, rice, and oats. Potassium: Potassium is an ion channel/systemic electrolyte for the body that is responsible for different functions – primarily in co-regulating in the production of ATP along with Sodium. The FDA recommends a hefty dose of 4700 mg a day of Potassium to avoid problems like Hypokalemia. Potassium can be easily obtained from natural food sources such as Potatoes and Bananas. Selenium: This mineral is essential for the functioning of Antioxidant enzymes such as glutathione peroxidase. The body requires only around 0.055 milligrams of this material per day to avoid a selenium deficiency. The natural sources containing selenium are eggs, nuts, and meat. Sodium: This element helps the body in the production of ATP while co-regulating with Potassium. A sodium deficiency can lead to hyponatremia, leading to a deficiency in ATP causing weakness. A sodium deficiency can also, like a deficiency in any other ions, cause a salt imbalance in the body, reducing water absorption. Recommended Daily Allowance for this mineral is 1500 mg that can be obtained from different food sources. However, the primary source of this mineral is Sodium Chloride, also known as table salt. Zinc: Zinc is required for the production of different enzymes like liver alcohol dehydrogenase, carboxypeptidase, and carbonic anhydrase. Zinc is also responsible for healthy skin functions. A zinc deficiency can cause problems in the skin and the digestive tracts. A healthy dosage of 11 mg a day is recommended to avoid such problems and can be obtained from sources like meat, nuts, dairy products, and grains. Multivitamins are supplements that are made to help you overcome deficiencies of one nutrient or another. Usually, there are certain deficiency symptoms among different demography of individuals that manifest with time. For example, a woman hitting her menopause will create some deficiencies in Calcium, Vitamin B Complex, Vitamin E etc. Similarly, a common deficiency trend can be observed among prepubescent children, women during their menstruation, people over their fifties and so on. In order to address these problems, different manufacturers have come up with different supplements tailored towards helping these specific groups in overcoming their deficiencies. These are the multivitamin supplements that contain the specific group of vitamins and minerals needed for the body’s growing needs. Most of the cases of nutrient deficiencies have more to do with the changes of the body and less to do with their diet. At other times, these deficiencies are caused by some form or disease. Finally, we have the cases of malnutrition and bad eating habits. In cases of impoverished families and malnutrition, we really wish that we see an improvement soon, because these are the cases that are the easiest to solve. However, for a pubescent child or a menopausal woman, we are powerless against nature. In cases of bad eating habits, the root of the problem can be solved through a carefully maintained diet. But let’s be real here: nobody really can keep up such a diet for long – especially people with terrible eating habits. Therefore, there are these times when these cases of nutrient deficiencies can’t be controlled properly and thus, the patient needs to be administered Multivitamins like the best multivitamin for women or children. But multivitamins can do more than just get rid of their deficiencies! Surprisingly, there has been reported benefits by different users after using Multivitamins. These benefits include weight loss; reduced appetite; slow down signs of aging; improve memories, cardiac and reproductive health; and reduce the risk of cancers. Multivitamins might come with its great benefits, but like everything else in this world, they also come with their own sets of problems if not taken properly. For example, there are cases of a calcium deficiency or just an iron deficiency, in which cases, just an iron or a calcium supplement would solve the problems. Now, if someone proceeds to take multivitamins in that case, he might get the desired results in terms of that specific deficiency but end up with an overdose of all the other nutrients. Apart from that, we need to understand that every person is different and so are their dietary needs. There might be cases of menopausal women not suffering any form of deficiencies just as there can be cases of specific deficiencies during puberty that are very uncommon. Using a general purpose multivitamin supplement for these cases would be ineffective at best, harmful at worst. We say that because cases of getting toxic levels of Vitamin D or A are extremely rare occurrences, even more so than from Multivitamins. That’s because multivitamins have a good safety margin, so, even when taken with nutrient-rich foods, it’s rare to get an overdose. Regardless, it’s always possible to overdose with multivitamins, so it’s important to stick to the recommended dosage. As long as you’re sticking with the recommended dosage, the chances of getting an overdose are almost non-existent. Even then, it’s always recommended that the users take their supplements after consulting a health specialist. Even then, Multivitamin supplements are mostly safe because of the mild side-effects they come with and due to the nature of the symptoms of OD. And for most people, just having the right form of multivitamins will do more good than harm. That’s why even doctors prescribe multivitamin supplements to their patients at times. Regardless, in our multivitamin reviews, we’re going to ensure that all the side-effects are mentioned properly and cautioned against. During our research process, we went through over 28,000 user reviews both from online and our volunteers. 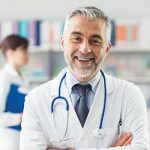 From these reviews, we determined the benefits, uses, and side-effects that its users have reported on several cases. Then we used our expertise to analyze the causes of these side-effects and how the supplements’ composition can actually correlate with the benefits. With that information, we narrowed down our search to over 100 different products for our secondary research. From them, we have shortlisted 20 of the most popular products for our most detailed research. For a more detailed research, we made a side-by-side comparison of the products. Then we analyzed the product’s ingredients, to find the side-effects and the benefits that its users might have missed out. Then we did another comparative research, cross-matching information gathered from online with our subject tests. Afterwards, we took all of these research data and did a final analysis of them to figure out which ones will be the best choices for whom. Finally, we chose the best supplements for different age groups and genders from among these to come up with our top 10. This review is tailored in such a way that you will find a supplement that is guaranteed to suit your needs. The dietary supplements come with their own sets of legal disclaimers and warnings as well as their own directions of use. Please read these labels carefully in order to better understand the benefits and risks associated with taking these supplements. Regardless of the brand or the type, almost all the supplements out there come with one type of side-effect or another. We have selected our supplements with full awareness of these side-effects. We have chosen only those supplements that come with the least number of side effects with the least severe effects. It’s also worth noting that some of these side-effects can be subjective. One side-effect reported by a user might not be reported. These side-effects are usually related to some form of allergies. As such, when one may have an allergic reaction that others might not. Therefore, one may even never encounter the side effects that are stated on the packaging. After considering 20 different Multivitamins for our list, we have considered their popularities, effectiveness, value and other features. These features provided an analytical result which helped us determine the best products from among them. After that, we began to analyze the benefits and the uses of these supplements to find out which ones would be the most suitable for which group of people. Finally, we now have a list of the best multivitamin products for the best purposes. Feel free to go through them and choose the one that best suits your needs. Vitafusion™ is a brand, dedicated to creating a variety of colorful, tasty and nutrient-rich products for individuals and families to suit their needs. They stand for delicious and enjoyable nutritional supplements for everyone in the community. They deliver a wide variety of products after collaborating with the Fruit Tree Planting Foundation and has set a goal of planting at least 200,000 fruit trees within 2020. Together, they’re not only producing the best and the tastiest of the supplements, but also delivering fresh fruits to the people and helping the environment through their tree plantation efforts, making this world far more sustainable for the future generations. 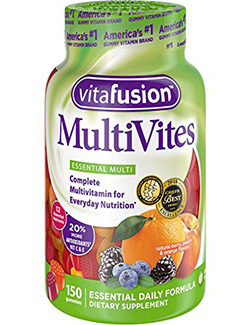 This supplement, the multi-vite, is one of the all-purpose nutritional supplement by Vitafusion. This supplement can be taken by any adult person, regardless of their age or gender. Although we have picks more specifically tailored for different age groups, this still would be a suitable choice for everyone in general. This product comes in a gummy form, making it chewable and tasty. It contains all the essential vitamins and minerals that are needed for your body. With this supplement, you can get all the vitamin A goodness of a cup of broccoli and as much Vitamin D as 5 ounces of salmon. It’s the taste and health combined in a package. This multivitamin supplement contains a whole host of vitamins and great health boosts. 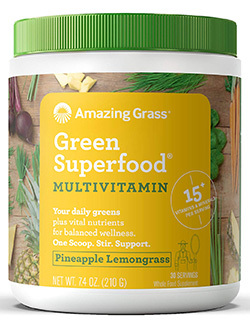 Not only is it an awesome product, but it is also one of the most affordable multivitamins on our list! This product contains Antioxidants that are helpful at reducing the “bad cholesterol” in your body. It’s an excellent source of Vitamin B6, B12, Pantothenic Acid, and Folic Acid. In most of the cases, this supplement will definitely help you with your Vitamin B deficiencies without the need of a separate vitamin B complex supplement. It contains a great amount of Vitamin C, almost as much as one whole tangerine and is a rich source of Vitamin A, D, and E. This product will help you with almost all the vitamin deficiencies. To understand the health benefits of these vitamins better, please refer to our section on the types of micronutrients. The dosage suggested for this product is just two gummy vitamins a day if taking as a form of dietary supplement. In order to increase and reduce the dosage, it’s preferable that you consult a physician or a nutritionist before doing so. Some of our volunteers have notified us about getting some cases of headaches and upset stomach. Although these side-effects haven’t been seen among all of our subjects, it’s highly recommended to stop using this supplement if such symptoms manifest. What makes it the best choice for adults? From over 2300 user feedbacks, we have taken both the positive and negative feedbacks into our consideration. The general consensus among the users shows a very positive review with only 1 negative review pitted against 13 positive ones. From that, we have determined this product to be very effective due to the number of users who have found benefits from this product. The price of this product is the most affordable in our list of multivitamins. Comparing this price with the effectiveness of this product, we could see that this product will give you great value for money. You can have around 2 and a half months’ of supply from just one bottle, given that you’re taking the recommended dosage of 2 gummies a day. With the price of each bottle being around $10, each gummy won’t even cost you over a few cents. This product has the second highest average user ratings on Amazon (4.5 stars) among the products in this list. But, for an all-purpose pick like this, this is the highest rating compared to the other general multipurpose supplements that we had shortlisted. It has garnered over 2000 reviews with a review frequency of the latest 10 reviews in 8 days, the 10 earlier reviews coming in within 8 days as well and the even earlier 10 reviews in 6 days at the time of our research. This great review frequency, the high rating and the high number of reviews show that this product is the most popular supplement. Finally, we chose this supplements to be the best for adults because this product can be taken by any adult person regardless of their age and gender. Adults can take this product without having to go for a more tailored supplement if they are unsure of what to take. This product is the best multivitamin for men, women, seniors, young adults and everyone in general. If you’re confused on which multivitamin to take, you could just choose this one and not run into any problems. Therefore, considering this product’s price, popularity, effectiveness, and purpose, we decided to give this product a Supplemania score of 9.5. Price $8.89Prices are accurate as of April 21, 2019 at 04:44 AM. Product Prices and availability are subject to change. Any price and availability information displayed on Amazon at the time of purchase will apply to the purchase of any products. Vitafusion comes into play yet again with this product of theirs. Just like all the other Vitafusion products, this one also comes in a gummy form, providing the women a tasty and fun way of getting rid of their nutritional deficiencies and problems that might ensue. 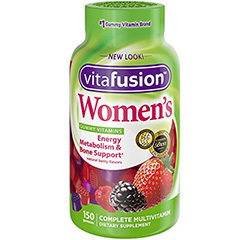 Vitafusion Women’s Gummy Vitamin provides a complete multivitamin solution with a formula, which has been designed to aid and support the women with their specific dietary needs. 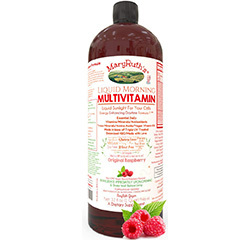 This multivitamin is a combination of the all essential vitamins and minerals, along with natural berry flavoring. These gummies have a great taste and will always be more preferable over a bitter pill to swallow (no pun intended). This is without a doubt the best multivitamin for women. This product is made to support the specific nutritional needs of women, providing muscle support, increased energy metabolism, and supporting the immune system. This product comes high in antioxidants, making it an ideal product for reducing cholesterol levels and thus improve cardiac health. As with the other Vitafusion Gummy products, this supplement needs to be taken at the suggested dosage of two gummies a day for the proper nutritional benefits. Some of our users have reported getting digestive issues such as an upset stomach and an irritable bowel. Some users have reported cases of acne breakouts that are actually preventable with the right supplements while others have reported a few cases of allergic reactions to this supplement. What makes it the best choice for women? We have taken the 2800 reviews into consideration, both from our online research data and our subject testing, and found them showing mostly positive reviews at the time of research. With a positive to negative review ratio of 7 to 1, we can see that more people vouched for its effectiveness than ones who didn’t. When compared to the other supplements tailored for women, we’ve found this ratio to be the highest, even if this wasn’t the highest on the list. Since it comes with one of the most affordable prices in the market, this product gives you an excellent value when comparing price per effectiveness. For around $8, you will be getting a supply for 1 and a half months, given that you take the recommended dosage of 2 gummies a day. It has gotten 4.4 stars on an average on Amazon. This is highest among the products in its category – Supplements for women. It has gotten the lowest review frequencies, which is the latest 10 reviews in 7 days, earlier 10 reviews also in 2 days and even earlier 10 reviews also coming in within 2 days, at the time of our research. Judging from all these reviews and the frequencies, we managed to conclude that this product is a definite favorite among the women. Lastly, we chose this supplement because the Women’s multi-vitamin and mineral formula is naturally flavored and specifically focuses on women’s needs. Therefore taking everything into consideration, we gave this supplement a solid 9 as our Supplemania Score and chose this as the best multivitamin for women. This product line also has a product that is specialized to suit the necessities of men as well. Although that product is a great one in itself, we still couldn’t include it in our list because our other picks cover all the necessary gender and age demographics. Price $39.68Prices are accurate as of April 21, 2019 at 04:44 AM. Product Prices and availability are subject to change. Any price and availability information displayed on Amazon at the time of purchase will apply to the purchase of any products. Garden of Life is a company that understands that dietary supplements are just supplements and not a real replacement for food. And they have come to realize the importance of food and the more practical rationing of the nutrients. That’s why, they don’t just create their supplements based on theoretical daily recommended amounts of nutrients people need; they design their products trying to emulate the nutrient ratios in the foods out there. Naturally, Garden of Life is strictly against the use of genetically modified organisms in the soil or any other forms of chemical in the production of their organic ingredients. They claim to sacrifice their efficiency and productivity for the sake of quality because Garden of life is not willing to compromise with the health of their consumers. 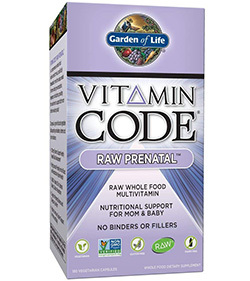 This multivitamin is great for expectant mothers and is targeted to help them with all of their specific health needs. It is our favourite pick as it was hugely popular with other customers and a great product. When a woman gets pregnant, the nutritional needs of her body changes as well as develop some forms of health issues. Above all, when a woman is pregnant, two lives, two different bodies and in turn, two different types of nutritional needs are involved. Most of the time, these different needs are what breeds one form of discomfort or health issue or another. In order to help you get over this problem, this product multivitamin has been designed. It contains all the nutrients necessary for both the mother and the child, despite which trimester she’s in. Even after the child is born, the mother would still benefit from this supplement. It will keep helping her during lactation. This product is completely vegetarian, dairy free and gluten free. The Garden of Life’s Multivitamin is targeted towards supporting the immune system of pregnant mothers and the growing child inside her womb. With this supplement, the mother and child can get rid of any deficiencies related to pregnancy and thus, it will positively affect the health of the newborn. It also supports healthy digestion and elimination of free radicals. Pregnant mothers should take one capsule per dose. The user will be required to take three such doses per day. Alternately, the capsules can be opened and dropped into a glass of water or juice and can be consumed as such. Please note that this product is high in iron and thus can cause fatal poisoning in children under 6 years of age. It is advisable to keep this product away from children. A few of the users have reported getting nauseous after using this supplement. A few others have reported getting digestive problems like gas while others reported a few cases of body and muscle pains. Why is this multivitamin suitable for pregnant ladies? From over the 2000 user feedbacks, we have considered their ratio of positive to negative reviews to determine the effectiveness of the product. With a ratio of 8:1, we chose to award it with the moderate effectiveness rating of 3. This rating has tied itself with a lot of other supplements made for pregnant women, however, other factors made it the best among them all. With a heavier price tag of around $39 for a bottle that would last you for a month with the daily recommended dosage of 3 tablets, you’re having to spend around 3 quarters per day, which kind of builds up on the costs. Due to this reason, we determined it to have an average value for money when compared to the other products on this list. But when looking at the other supplements in this category, the prices are very reasonable. The reason for this higher price is due to it being specialized for mother and baby care. It comes with 4.2 stars of average rating on Amazon. It also has a review frequency of 6 days, 7 days and 6 days consecutively. That means that this product is getting 10 reviews in less than a week. Given that people are inclined to buy more than leave reviews, we can easily say that this product is selling in hundreds within a week. 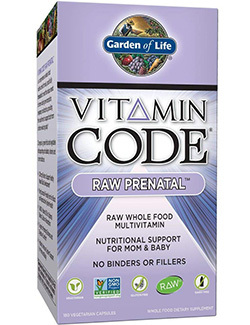 Although we’ve seen better review frequencies than this, it has gotten the highest number of reviews in Amazon among multivitamins for pregnant women. This product is definitely popular. This supplement is made with a unique formula that is specially designed for both the mother and the baby – both during the pregnancy as well as after giving birth. Considering its towering popularity, effectiveness, function, and value, we’ve awarded this product a Supplemania Score of 8.7. This is the best multivitamin for women in their pregnant state. Price $12.67Prices are accurate as of April 21, 2019 at 04:44 AM. Product Prices and availability are subject to change. Any price and availability information displayed on Amazon at the time of purchase will apply to the purchase of any products. 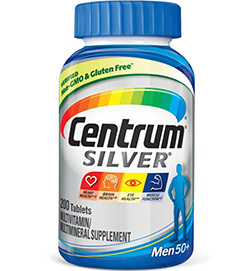 Centrum Silver creates the best multivitamins to support the health and dietary needs of men and women above the age of 50. With growing age, the body deteriorates and the dietary needs of the body changes. In fact, they actually have an increased demand to keep up with the loss, however, their bodies keep losing their ability to absorb the nutrients properly. That’s why Centrum Silver Multivitamins have the nutrients rationed in small amounts for easier absorption, and at the same time, contain all the nutrients required for the development of the body. If taken on a regular basis, the vitamins and magnesium will help the user maintain and fuel their healthy muscles, in turn, providing them with a boost of energy for example. This is our pick for senior citizens, as it is really well designed to suit the needs of people over 50. We like it because it is really effective, isn’t too expensive and has a great rating from customers. 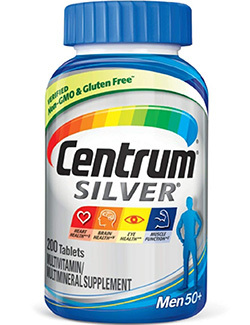 The Centrum Silver is created with non-GMO and gluten-free ingredients. With this specific product, the best multivitamin for men above 50, the users will get the recommended amounts of key vitamins and minerals in their bodies. However, Centrum also creates products for senior women. This product is known to provide energy and support the immune system. It has been found to increase the metabolism and is build to improve the muscle functions. All in all, this product is created to aid the seniors with their deficiencies and help them cure the symptoms and pains that come with age. The suggested usage instructions for this product says that adults and seniors alike should take one tablet each day after a meal with some food. It is strongly recommended to not exceed the suggested dosage. The users have reported cases of getting pains. For example, these users have reported getting stomach aches, some form of headaches and/or migraine and some pain in the kidney regions. These are pretty serious symptoms and one should discontinue using the product if such symptoms are seen. Why is this the best for people above 50 years of age? This product has the highest effectiveness rating among the products on our list; determined by the overwhelming ratio of positive reviews from the 1000 user and subject feedbacks. With approximately 1 negative review among 19 positives, this product shows that approximately 95% of the subjects would vouch for its effectiveness. The Centrum Silver gets full marks for its price to effectiveness ratio, making it worth every penny. This is because of the product’s low price tag of $12, for about 200 tablets. If following the recommendations on the label and taking 1 tablet per day, this product will last you for over 6 months, costing you only around 7 cents per day. It has the highest average user rating on Amazon: a whopping 4.6 stars when compared to the other products on our list. This product got review frequencies of 9 days, 10 days and 9 days, respectively for the latest 30 reviews (with a 10-day increment). This review frequency isn’t too much to brag about, but seeing its competitors, we’ve found its review frequency to be a great one. From that, we can conclude that this product is very popular among its users. This supplement helps provide energy to its users and improve their immunities, making it the most suitable product for people over the age of 50. With its vitamins, antioxidants and other nutrients tailored to suit the needs of the elderly, this product becomes the number one choice for senior people. This product comes in two pack sizes, 200 and 250 Counts. This product also comes in a women’s supplement form to be fit for a more specific demography. Although this product couldn’t be selected as the best multivitamin for women, this definitely is a great solution for senior women. Therefore, taking everything into consideration we gave it a 9.7 as our Supplemania Score. Price $19.99Prices are accurate as of April 21, 2019 at 04:44 AM. Product Prices and availability are subject to change. Any price and availability information displayed on Amazon at the time of purchase will apply to the purchase of any products. Gensavis Pharmaceuticals is a pharmaceutical company based in the US. It specializes in designing and developing products that are focused on curing the widespread cases of iron deficiencies. Gensavis aims to provide great quality dietary supplement products and bring their consumers a peace of mind with the assurances about their efforts that they place in order to attain this goal. NovaFerrum is the name of the iron supplement which can be bought over the counter without the need for a prescription. This product is created to aid the users with their iron deficiency whether they be in their pediatric stage or their geriatric. The main ingredient of this supplement is a polysaccharide-iron complex without any iron salts like Ferrous Gluconate, Ferrous Sulfate or Ferrous Fumarate. This multivitamin is engineered to be perfect for infants. It is a little expensive compared to other options, but who wouldn’t pay for the best product on the market for their children?! This product not only contains iron, but also 8 essential vitamins, including Vitamin D, which is necessary for a better absorption of iron as per the recommendation of the American Academy of Pediatrics. This product is free from any form of alcohol, sugar, gluten, dairy, dye, lactose, soy, peanuts, corn or any types of tree nuts. It does not contain any type of artificial sweeteners or additive colors. This product is Kosher, Vegan, Halal and naturally sweetened. Because this product is intended for kids, this supplement is created with all natural products. 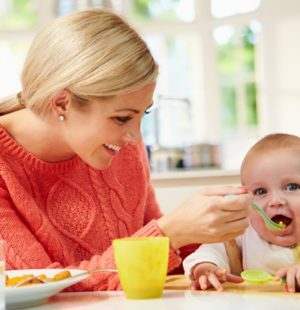 This product will take care of your infant’s deficiencies, which is a common occurrence among most infants due to their aversion to baby food and eating in general. 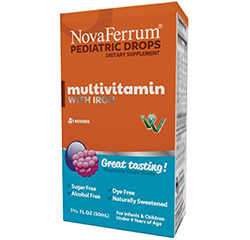 For Toddlers, infants and all children under four years of age, the recommended dosage is 1 milliliter of this supplement per day, to be administered through a dropper, unless directed by the physician otherwise. A few cases of nausea and vomiting have been reported by the infants’ parents after administering the daily recommended dosage to their children. Why would you choose it for your toddler? After going through over 1400 different user reviews online and the feedback from our subjects, we judged its effectiveness from their positive to negative review ratio, which was 15:1. This brought this product the highest effectiveness rating among the supplements for children. The price of this product is a bit expensive compared to the other multivitamin Supplements for children. For a bottle costing you around $19, you’ll get enough dosages to last you for a month and a half, given that the recommended daily dosage is being maintained. This means that you’re going to get around 40 cents’ worth of value per dose. This product has gotten four and a half stars on Amazon. This second highest average user rating, coupled with its review frequencies of 9, 23 and 11, is enough to determine its popularity. 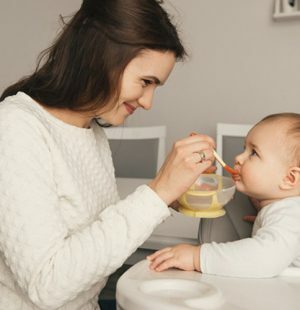 Although the review frequency for this product might not be something to boast about, we can easily analyze the causes behind this: Parents are usually more concerned about what they give their infants and are hard-pressed to trust dietary supplements. Above that, with a higher price tag, the sales are supposed to be lower. Regardless, when compared to the other supplements for infants on the market, its popularity index easily defeats them all at a wide margin. 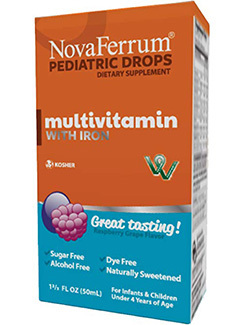 The Multivitamin with Iron Pediatric Drops comes with a low Osmolality rating. A low osmolality is important for any supplement containing iron for an infant in order to avoid electrolyte disturbances leading to dehydration. Especially so with infants who are born prematurely. Therefore, after taking its osmolality, price, effectiveness, and value into consideration and comparing it to the other similar products on the market, we decided to give this a 9.1 as our Supplemania Score. 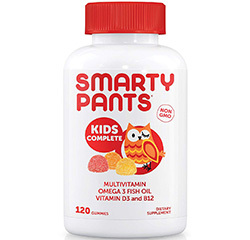 Transparency: They believe that their consumers have the right to know what they are taking and whether they’d be actually healthy or not, and that’s what SmartyPants is going to give them. Excellence: They want to keep criticizing themselves in order to keep on improving. Transformation: For SmartyPants, they want to help people transform their lifestyles, mood, and health. And they want to transform themselves for the better. 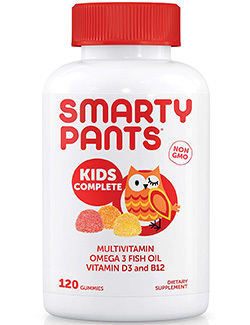 This is another great multivitamin for children of all ages. It has some of the highest customer reviews we have seen, and it also a really affordable product, making a great all-round choice. Made for children this product comes in a gummy form that they’d just love to have. This gummy vitamin is made with all the essential nutrients like Vitamin D3 and Omega Fish Oils. The ingredients in this product is easily absorbed by the body. This product is made with non-GMO and free of any allergens. It contains no artificial coloring or sweeteners. It does not have any kind of harmful preservatives or any artificial flavoring. The products are tested by a third party in their own lab. 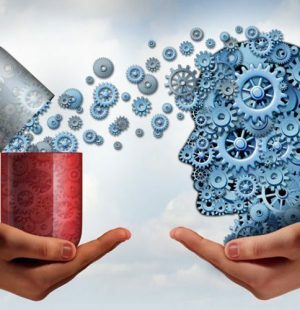 The Omega 3s in this supplement can help the user build up the cell membranes in his/her brain, which in turn, can help increase the brain’s development and benefit the user’s cognitive functions. Researches also showed that the consuming Omega 3 DHA and EPA may support the user’s cardiac health. The Vitamin D has a primary role in the body’s calcium absorption and make build stronger bones. In addition to giving stronger bones, vitamin D also helps the immune system. With all these nutrients packed into one, your child’s body would get rid of all its deficiencies and prepare him/her better for puberty. This gummy supplement is for children 3 years or older. The children should take 4 gummies daily, under the supervision of an adult. The supplement may be taken regardless of a full or an empty stomach. Parents have reported that their children got cases of diarrhea, nausea, vomiting and increased heart palpitations after taking these supplements. If you ever face such concerns, discontinue using the product. What determined its suitability for kids? 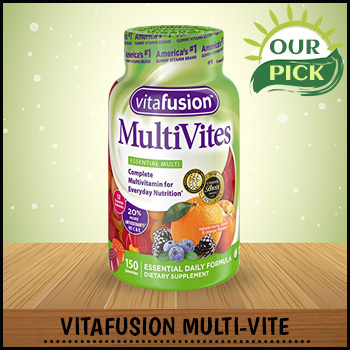 With over 2900, this product has clearly got the highest number of reviews among the multivitamin product. We have taken both their positive and negative feedback into consideration. Theoretically, the feedback from the online users showed a positive:negative ratio that’s below average. With only 5 positive reviews against each negative review, we could only conclude that this product has been found to be not effective by at least 17% of its users. However, if we notice the general trends among the reviews, we can easily say that products with a higher number of reviews will always have difficulties in maintaining a good review rating. The ratio will always drop when there is a high competition in the market and we usually choose not to acknowledge a product that sounds too good to be true. So, we had to turn to our volunteer feedback for a more accurate result. With those results in hand, we have been able to determine that this product is indeed quite effective among that select group and worthy of being on this list. Regardless, we’d rather stick to our procedure and award it only 2 for its effectiveness. The price of this product is very affordable, the second among the cheapest when considering the price per dosage. You will have around 1 month’s of supply from a bottle if you take the recommended 4 gummies a day. Each bottle cost around $16, that places the dosage cost around 18 cents per gummy. With such a price, this boosts the value per effectiveness by a huge margin. It has a 4.2-star rating on Amazon. It also has a review frequency of 3 days, 5 days and 3 days at the time of our research. Compared to the other products in our list, this is the best frequency we’ve seen so far, making it the highest sold product among the multivitamins. With that, we’ve been able to consider this product the most popular one in the market. Considering the popularity of this product, we can say that this is one of the supplements acknowledged by the parents and loved by the children. And after taking the other factors into our consideration, we gave this product a Supplemania score of 8.8. 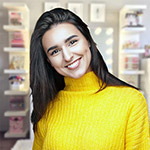 Price $34.99Prices are accurate as of April 21, 2019 at 04:44 AM. Product Prices and availability are subject to change. Any price and availability information displayed on Amazon at the time of purchase will apply to the purchase of any products. Optimum Nutrition is a household name for every gym-goer, bodybuilder and athlete. They are the go-to source for most types of amino acid supplements and thus is a trusted name for supplements geared towards the active people. Optimum Nutrition is a part of Glanbia, an international company producing cheese and nutritional ingredients. Optimum Nutrition also has another brand known as the American Body Building, producing sports nutritional products. These two companies collaborate to bring all the active people around the world great products such as sports drinks, powders, energy bars, tablets, and capsules. 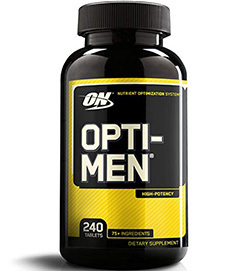 Opti-Men provides the perfect nutrition balancing and optimization to the body using over 75 active ingredients. These ingredients come in four blends, designed to help active people and athletes the nutritional support they need. Each dose of this supplement contains free forms of amino acids, some essential minerals, antioxidants, vitamins, and botanical extracts. They are all measured just in the right amounts upon which you can build a foundation with a balanced diet. This multivitamin is tailored to people who work out a lot or are professional athletes. It comes in a male and female version and is focused on the needs of people whoa re active and athletic. Opti-men delivers 25 different types of vitamins and minerals with just 3 tablets. This product comes with over 75 ingredients, with the formula including some foundational amounts of botanical extracts. Being organic in nature, these extracts can help the user build a thorough, healthy and balanced diet. Take 3 tablets a day with or after a meal for optimum effect. Do not exceed the recommended dosage without a doctor’s suggestion. Several users have reported symptoms similar to a hangover. These symptoms include headaches, nausea and stomach aches. Other side-effects that have been observed are muscle cramps and a breakout of rashes. What determined its suitability for athletes? Like with all the other products on the list, we’ve analyzed the 2200+ reviews and feedback to find a positive:negative ratio of 7:1. With that, this product gets a decent effectiveness rating. You can have around two and half months’ of supply from a bottle if you take three tablets per day. Each bottle cost around $34, which is around 15 cents per tablet. With that price, we can say that this gives a great value for money. It had a lower average user rating on Amazon at the time of our research. However, with the ratings being above 4 stars, excellent review frequencies of 4, 5 and 9 days, and with over 2000 reviews on Amazon, we just had to vouch for its popularity. This product comes with a comprehensive, 75+ active ingredients, in 4 blends that are specifically designed to support the nutritional needs of athletes and physically active men. This product comes with a different version suited for female athletes as well. This is the best multivitamin for women who are active and athletic and our regular women’s pick just wouldn’t be able to keep up with their needs. Therefore taking everything into consideration we gave it 8.9 as our Supplemania Score. Price $23.97Prices are accurate as of April 21, 2019 at 04:44 AM. Product Prices and availability are subject to change. Any price and availability information displayed on Amazon at the time of purchase will apply to the purchase of any products. Doctor Tobias Ihde is a sports science and nutrition expert from Germany. With a personal conviction of bringing health and happiness to people’s lives through an active lifestyle and a natural diet, he established his company with his name. With his years of studies, research and experience working at the dept. Of Sports Science and Medicine, he had obtained the required understanding of the human body. With that, he set out to manufacture nutritional products for the people around the world. 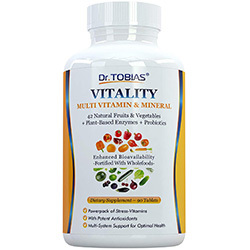 Vitality Multivitamin and Mineral is a potent food-based product that provides all the essential nutrients along with spirulina, complete fruit complex, juice extracts, fiber, enzymes, herbs, vegetable complex, and trace minerals. This is a food based multivitamin that has all the great nutrients you need. It is a really effective product, although it is quite a bit more expensive than other multivitamins on the market. This supplement is meant to support the cardiac system of the body. Apart from that, this product is also necessary to build stronger bones and the immune system. This organic multivitamin also helps your digestive systems and supports the nervous systems and improve the hormone productions. An adult should take a maximum of 3 tablets a day, preferably after a meal. However, as with all other supplements, the dosage can be tweaked following the directions of a healthcare professional. The side effects that have been observed for this supplement includes cases of reported headaches and upset stomachs. Why is it the best among the organic multivitamins? This product gets the highest effectiveness rating – a full 5 stars. Among the 2100+ reviews, we could find approximately 1 negative review among 24 of the reviews, bringing its effectiveness to the highest. This product is comparatively a bit more expensive. However, we’ve seen a trend among organic products that they are usually more expensive. Given that organic products tend to leave no long-term damage on your system, this product will be a worthy choice. You will have around one month’s of supply from a bottle if you take 3 tablets per day. Each bottle cost around $23, which gives you a capsule for just a little under 30 cents. It has one of the highest user ratings on Amazon, 4.6 stars. It also has an excellent review frequency of 2 days, 3 days and 2 days at the time we researched. Comparing this frequency to our other researched supplements it has the best frequency among all the products on this list. The Vitality Multivitamin is all-natural and completely organic. It’s formulated and made from raw fruits and organic vegetables including cranberry, grape seeds, blueberry, strawberries, raspberry, bilberry, alfalfa, pomegranate, carrots, beets, wheatgrass, cherry, broccoli, spinach, dandelion, spirulina and much more. This product gets a 9.7 Supplemania Score. Price $39.95Prices are accurate as of April 21, 2019 at 04:44 AM. Product Prices and availability are subject to change. Any price and availability information displayed on Amazon at the time of purchase will apply to the purchase of any products. Mary Ruth Organics is a company with the life-long goal of providing their consumers with the best of the top-quality, innovative nutritional supplements that can support their health and general well-being. This liquid Multivitamin works as a complete multivitamin solution for adults and children, male and female alike. This takes care of the body’s daily needs. It’s one of the best vitamins coming in the liquid form with all the essential vitamins, antioxidants, minerals, and amino acids. One of the various benefits this product comes with is giving its user increased energy levels. This product is also manufactured with the aim of giving its users a glowing skin, stronger cuticles and nails. 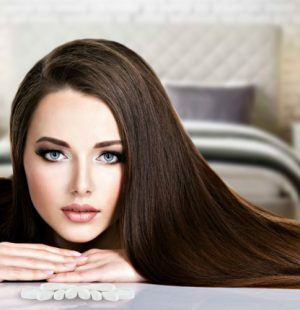 You can also try this to have great, healthy hair. 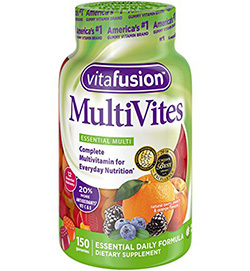 This multivitamin is different from the rest, as it comes in a liquid form. It can be for all ages and genders, and aims to take care of all your body’s daily needs. Be warned it doesn’t come cheap. The suggested usage instructions say that adults should take 1 serving size of 1 oz per day. In case of pregnant women, lactating(breastfeeding) women, children or seniors who are over 65 years of age, should definitely consult a physician or healthcare professional before using this product. Some of the volunteers of our subject testing has reported several cases of digestive issues. Most of these cases are related to problems with the gastrointestinal system such as Gas, Nausea, and Vomiting. If any such symptoms begin to manifest, you should discontinue the usage and consult a physician. Why is this the best liquid multivitamin? With over 1500 user reviews online, we found a 18:1 positive-to-negative review ratio among them. With the general consensus among the users being that this product has been effective, we gave it one of the highest effectiveness ratings during our research. This is an expensive product. Not only because of its price, but also due to the dosage and the amount of multivitamin you get in the $40 price range. Even so, you’re getting 1 months’ worth of multivitamins from this product, despite each dosage costing you around a dollar and a quarter. Considering that this is the only liquid multivitamin available for the adults this gets the highest value in terms of effectiveness and price among the liquid formed supplements. This also comes with a 4.6 stars on Amazon, being the third product on the list to get this rating. Regardless, that’s the highest we’ve seen in the list, speaking volumes about its popularity. This product also has a great review frequency, reinforcing its popularity index even further. Clearly, the liquid multivitamin is just as popular among its users as the tablets or the gummies. This is a complete multivitamin for men, women and children, which may be added to any drink of your choice or recipe. Therefore taking everything into consideration we gave it a 9.6 as our Supplemania Score. Price $21.99Prices are accurate as of April 21, 2019 at 04:44 AM. Product Prices and availability are subject to change. Any price and availability information displayed on Amazon at the time of purchase will apply to the purchase of any products. Amazing Grass has been established in 2002 by their owners Todd and Brandon. They shared a passion for the outdoors and decided to live an active and a healthy life. Brandon had convinced Todd to switch to a healthier alternative to coffee – a green tea formula that he had invented. Upon taking his advice, Todd saw some changes in his body. The results were heightened energy levels and better digestion. Upon seeing these results, Todd too became a believer of Brandon’s drink products and decided to quit their day jobs to start up Amazing Grass. Now, they are dedicated to delivering more than just drinks with the same mission of helping people out with their healthy lifestyles through plant-based, organic nutritional supplements. This multivitamin comes as a powder, so has the added bonus of having more flavours and taste additives than other choices, but this does make it more expensive. 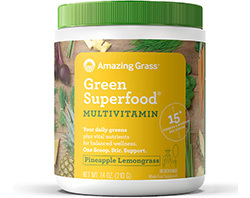 The Green Superfood with Pineapple Lemongrass is a mixture of nutritious green ingredients, phyto-nutrient-packed vegetables and food along with cereal grasses. It’s also packed with probiotics and digestive enzymes with an infusion of delicious vitamins in order to help you obtain your recommended daily intake of fruit and vegetables. Support the overall health of the users and improve their immunities. This supplement also aids the imbibers with their natural digestive functions and helps them balance and increase their body’s alkalinity, naturally. In order to prepare this supplement for consumption, please take 1 scoop of this powder. Mix the scoop with 8 ounces of water, juice or any drink of your choice. Stir well to create the drink. Consume it once or twice daily in order to get the maximum benefits. Reported cases of upset stomach have been observed. Notable symptoms of them include several cases of Diarrhoea and a few cases of nausea and vomiting. However, the symptoms could also be attributed to the liquid the powder is being mixed in and could not be properly linked to this supplement alone. Why is this the best among the multivitamin powders? Getting a positive to negative review ration of 8:1 among the 1200 reviews, this product gets an average effectiveness rating. However, among the drink mixes and other multivitamins coming in a powdered form, this one takes the lead in terms of its effectiveness. Being a drink mix, this product has more flavorings and other taste based additives besides the nutrients. This piles up on the costs a little, making this product more expensive than the others. You will get 30 servings from a packet of 7.4 ounces of powder. Priced around $20, each serving is costing you around 65 cents. Costing around the price of a similar amount of Dr. Pepper, this would be a healthier choice. With 10 reviews coming in before a week, this supplement definitely sells in 100s. With a 4.3 star rating, this product definitely is popular. This product gives you a combination of natural vitamins, great exotic flavors, and a blend of fifteen different types of added vitamins and minerals. Regardless of the gender, this product would be a great, tasty solution to your problem with finding the best multivitamin for women and men. Therefore taking everything into consideration we gave this a rating of 8.3 as our Supplemania Score. 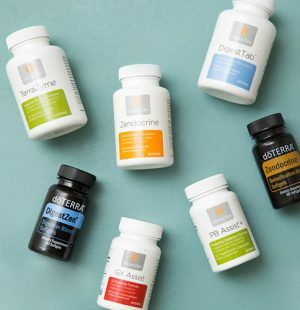 With that list taken care of, it’s always important to remember that these supplements are meant for general age groups, genders, and other demography. If you’re suffering from any specific type of deficiency, you should consult a doctor for a more specific treatment rather than go for a generalized multivitamin. But as we’ve mentioned in our earlier sections, even if you do go for a generalized solution, it’s highly unlikely that you’d develop any cases of an overdose of nutrients due to the amount of nutrients present in these supplements. But when you do pick one off the shelves and try to self-medicate, take special care to choose the ones that are tailored to suit the needs of the people of your gender, age group, and activeness. And always keep in mind that a dietary supplement is not a dietary replacement. Your diet should always be balanced for you to remain healthy. Stay safe, stay healthy.